Contrary to what Pixar would have you believe, penguins don't all live in the icy Arctic regions - we have plenty of African penguins along our shores. 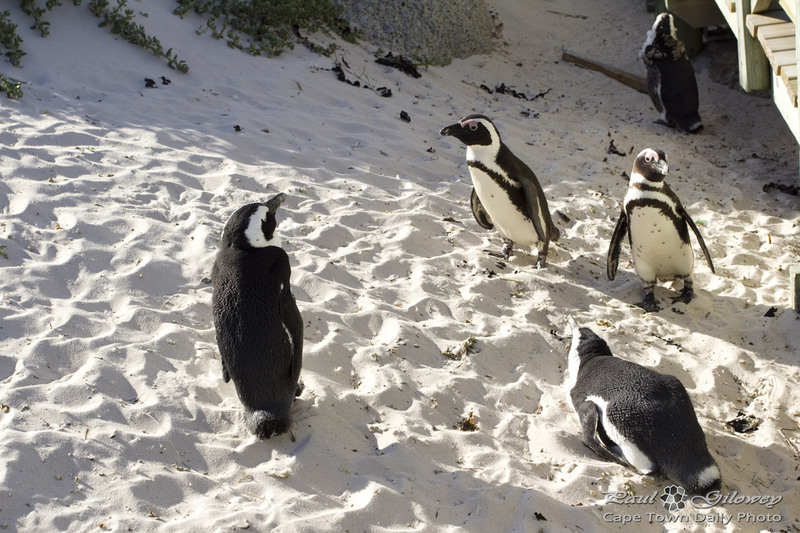 Two places that you'll more than certainly see penguins is at Betty's Bay, and this place, Boulders Beach. What's awesome about Boulders Beach is that it's a regular beach where people are allowed to bathe in the sun and swim in the ocean together with the penguins. Entry to Boulders Beach is paid for and strictly controlled as not to overcrowd the penguins. Posted in General and tagged beach, birds, boulders, penguins on Sunday, 28 October, 2012 by Paul. What a treat… loved the last couple of photographs of around CT. It’s funny, when you’re there, it’s all so “normal” but it’s really just soooo exceptionally beautiful. Thank you!